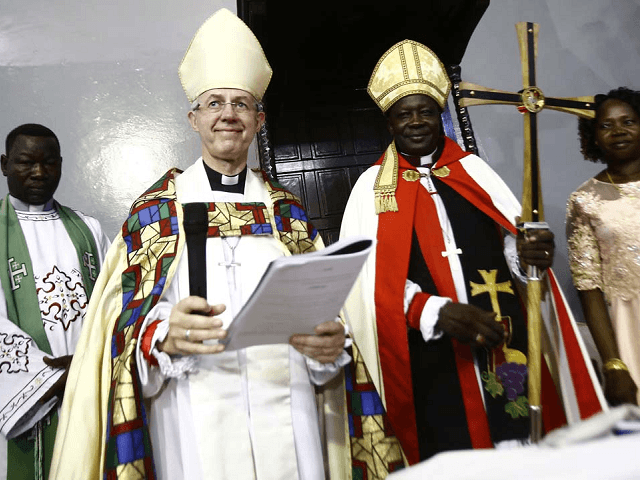 AFP — Archbishop of Canterbury Justin Welby on Sunday declared Sudan the 39th province of the worldwide Anglican Communion, six years after the predominantly Christian south gained independence from the north. Welby said that creating a 39th Anglican province with its own Khartoum-based archbishop was a “new beginning” for Christians in Sudan. He installed Ezekiel Kondo Kumir Kuku as the country’s first archbishop and primate at a ceremony in the capital’s All Saints Cathedral attended by American, European and African diplomats and hundreds of worshippers. “We welcome the new primate with jubilation,” Welby announced to a cheering crowd as he handed a cross to Kuku. Welby, spiritual head of the Church of England and of the global Anglican Communion, said it was a rare opportunity for an archbishop to declare a new primate. “It is a responsibility for Christians to make this province work, and for those outside (Sudan) to support, to pray and to love this province,” he said. The idea of a separate Anglican province in Sudan was first discussed in 2009 as it became clear that the south would secede. Human rights and Christian campaign groups have regularly accused the Sudanese authorities of persecuting Christians and even destroying churches in the capital since the split. Since the 1989 coup that brought Islamist backed President Omar al-Bashir to power, authorities in Khartoum have pursued Arabising and Islamising policies in a bid to unify the country. This has stirred resentment and helped trigger a devastating civil war that ended with the secession of the mainly Christian south. Christian communities in Sudan today are mostly found in the Nuba mountains of South Kordofan state. Exact numbers are unavailable. US President Donald Trump is to decide on October 12 whether to permanently lift sanctions imposed in 1997 over Khartoum’s alleged backing for Islamist militant groups. Several campaign groups have urged Washington to maintain the sanctions or formulate new ones to address concerns over human rights violations.